The board of Idaho Trails Association have approved support of Wilderness designation for the Scotchman Peaks. They join a long list of supporters for the proposal! The Idaho Chapter of the Backcountry Hunters & Anglers have endorsed Wilderness designation for the Scotchman Peaks. “The Idaho Chapter of Backcountry Hunters and Anglers is the ‘Sportsmen’s Voice for Wild Public Lands, Waters and Wildlife’ and we represent over 900 members throughout Idaho. As an organization we are dedicated to ensuring access and opportunity for hunters and anglers on public lands and waters while promoting the principles of fair chase. It is under these tenets that we support the proposed Wilderness Designation of the Idaho portion of Scotchman Peaks.” Read the rest of their letter to the Friends here. As long supporters of Wilderness designation for the Scotchman Peaks, the Spokane Mountaineers have officially endorsed the proposal. “Members [of the club] visit the area every year — not just [the portions] accessible by trail but off-trail as well, and the pictures they bring back are of a wild area that deserves protection.” –Luke Bakken, Conservation Chair. See their letter to the Friends here. Ken Thacker, President of the Kinnkinnick Native Plant Society, wrote to the Bonner County Commissioners in support of Wilderness designation for the Scotchmans. He highlighted the importance of the area for native plants, specifically in the Lightning Creek Treasured Landscape. Read the KNPS letter here. Clif Bar and Company wrote to Senator Risch on behalf of their more than 1,100 employees to let him know they support Wilderness designation for the Scotchmans. Read the Director of Company Affairs’ letter here. The Federation of Western Outdoor Clubs reaffirmed their support for Wilderness designation for the Scotchmans in their October 2017 letter to FSPW. 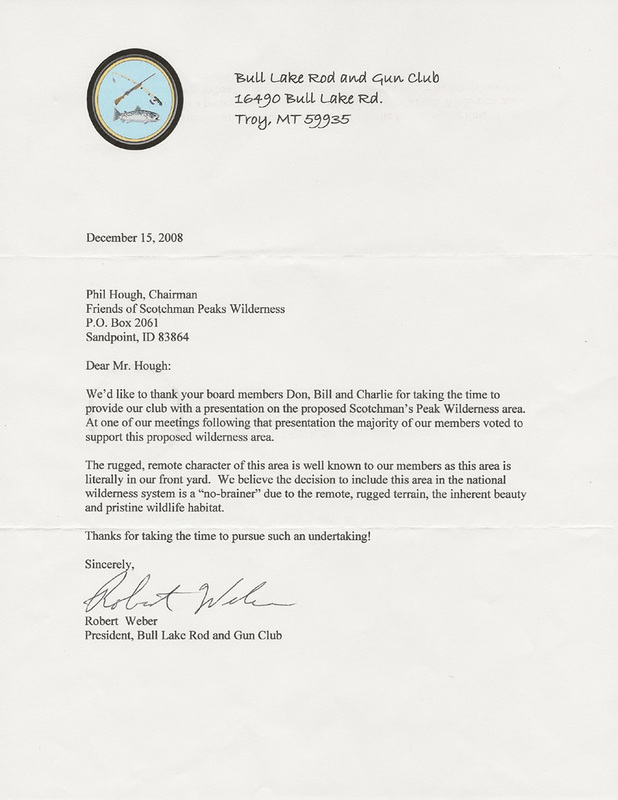 The Panhandle Chapter of Trout Unlimited supports Wilderness designation for the Idaho portion of the Scotchmans because it “will protect and enhance the fishery habitat of Lightning Creek and the lower Clark Fork River.” See their June 2017 letter to Senator Risch here. 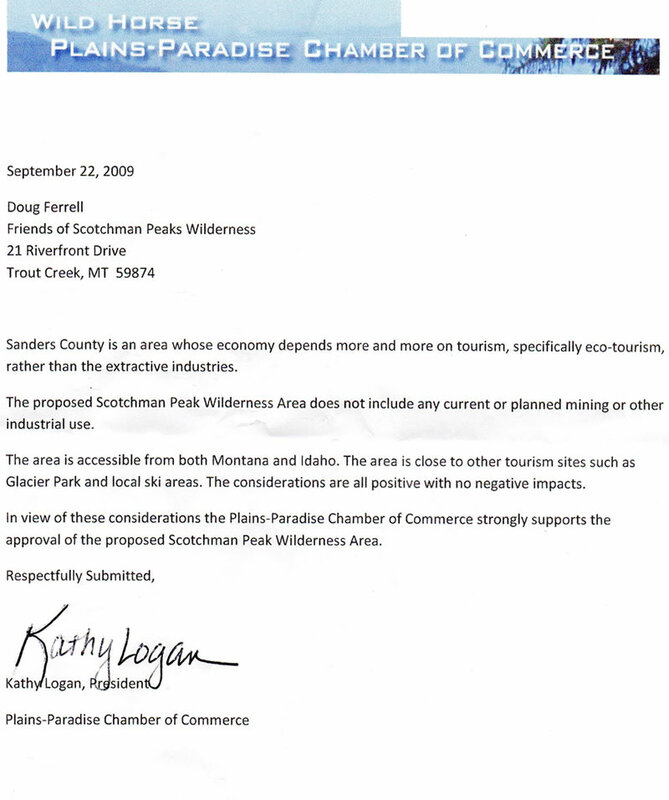 The Panhandle Nordic Club supports “making Scotchman Peaks a wilderness area.” Read their letter to Senator Jim Risch urging to protect this area due not only to the scenic and recreational value, but also because it would “enhance the economic vitality of the nearby communities.” Take a look at the full letter here. The Federation of Western Outdoor Clubs passed a resolution supporting Wilderness designation for the Scotchmans. Read the resolution here. The Pend Oreille Pedalers bicycle club express their “whole-hearted support for the designation of the Scotchman Peaks roadless area as wilderness.” See why this group of road and mountain bike enthusiasts believe that this area should be protected here. Don Childress, President of Panhandle Trout Unlimited, wrote Idaho Gov. Butch Otter in support of Wilderness designation for the Scotchman Peaks. Read the letter here. Idaho Conservation League‘s long-term Executive Director, Rick Johnson, wrote to Senator Risch thanking him for introducing the Scotchman Peaks Wilderness Act and highlighted the many benefits of designating the Idaho portion of the Scotchmans as Wilderness. Read Rick’s letter here. The Twin Falls Times-News gave Senator Risch “cheers” for introducing the Scotchman Peaks Wilderness Act. See the full text of the “Cheers” here. 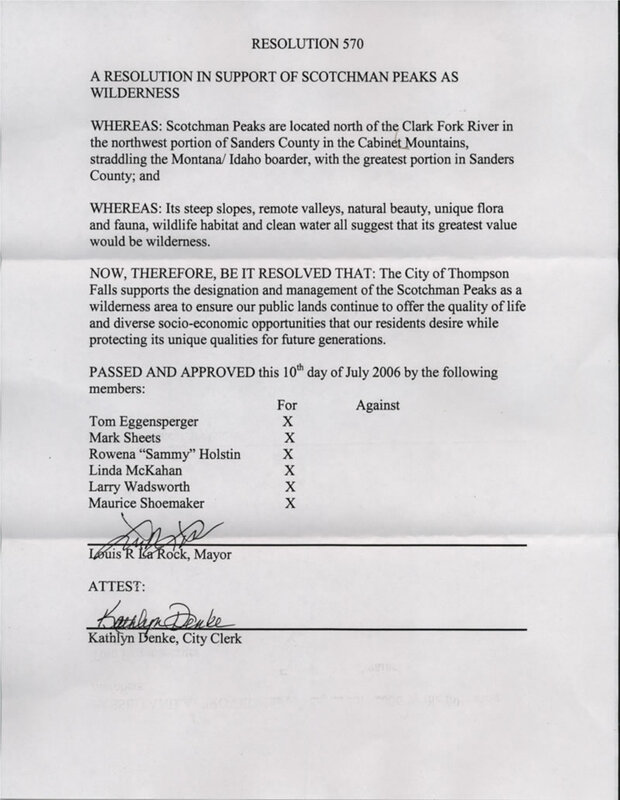 The City of Thompson Falls has re-affirmed their formal support for Wilderness designation. Their latest letter of support comes after an initial letter in 2006. See the 2016 letter here. Marty Trillhaase, Editorial Page editor of the Lewiston Tribune, urges Sen. Risch to introduce legislation for the Scotchmans. Read his editorial here. Founder and President of Evergreen Magazine, Jim Petersen, wrote to Idaho’s delegation fully supporting Wilderness designation for the Scotchman Peaks Roadless Area. Read the letter here. 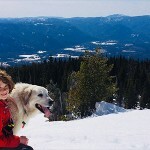 Cameron Rasmussen, Editor of The Sandpoint Reader expressed his support, as well as that of Publisher Ben Olson, for the proposed Scotchman Peaks Wilderness Read the Cameron’s piece here. Marc Brinkmeyer, Owner of Idaho Forest Group, personally delivered this letter to the Idaho congressional delegation in Washington D.C. Read the letter here. Caroline Lobsinger, editor of the Bonner County Daily Bee agrees that now is the time for the Scotchmans. Read her editorial here. The Missoula paper thinks the Scotchmans should be a wilderness — on both sides of the border Read their editorial here. The Spokane Spokesman-Review editorial board recognizes that the Scotchman Peaks are “gaining altitude” Read their opinion here. Idaho Master Naturalists Pend Oreille Chapter sent a letter to Idaho Senator Mike Crapo asking him to support legislation to designate the Scotchman Peaks as Wilderness. Read their letter here. The Commission of Bonner County passed a unanimous resolution asking the United States Congress to designate the Idaho portion of the Scotchman Peaks as Wilderness. The Commissioners’ resolution is found here. In 2018, the Board of Commissioners rescinded the previous Commission’s resolution. Montana’s Governor, Steve Bullock, expressed his support for our efforts for wilderness designation in March of 2015. The Governor’s endorsement (PDF file) is available here. In February, the Greater Sandpoint Chamber of Commerce sent a letter to the Idaho Delegation asking that they introduce legislation to designate the Scotchman Peaks as Wilderness. Read their letter here. 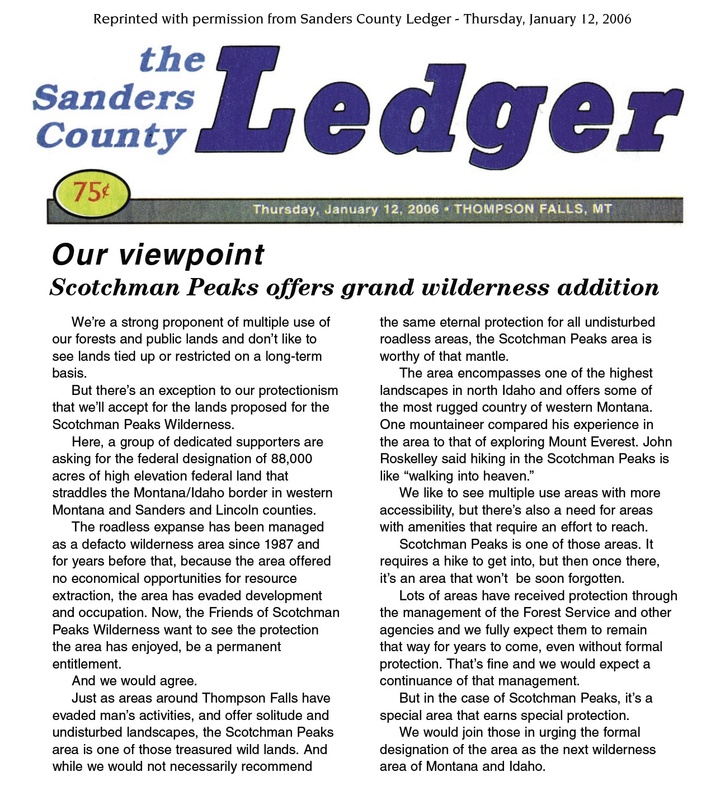 The Sanders County Ledger reiterated their positive take on the Scotchman Peaks proposal. Read the editorial here. 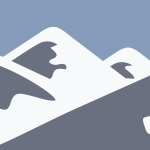 Ben Long wrote an article titled “Collision Course: Snowmobiles and Mountain Goats” and highlighted the Montana Chapter of Backcountry Hunters & Anglers’ support for the Scotchman Peaks becoming Wilderness to protect mountain goat habitat. See page 12 of their Winter 2009 Backcountry Journal for the article and page 13 for the Scotchmans shoutout. 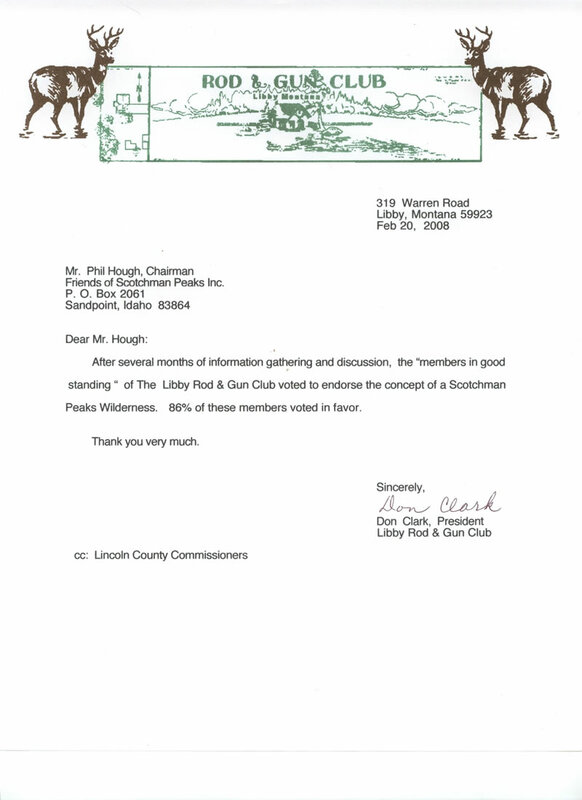 The Friends of Scotchman Peaks are pleased and proud to announce that members of the Libby (MT) Rod & Gun Club have voted to endorse the Wilderness designation for the Scotchman Peaks roadless area. We appreciate their support! The Greater Sandpoint Chamber of Commerce Board of Directors support the designation and management of the Scotchman Peaks as a wilderness area to ensure our public lands continue to offer the quality of life that our residents desire while protecting its unique qualities for future generations. From the City of Thompson Falls comes such a simple statement, yet so true…..”WHEREAS: Its steep slopes, remote valleys, natural beauty, unique flora and fauna, wildlife habitat, and clean water all suggest that its greatest value would be wilderness”……..we couldn’t agree more! The Idaho Native Plant Society board passed a resolution endorsing designation of the Scotchman Peaks as Wilderness. View the resolution here.